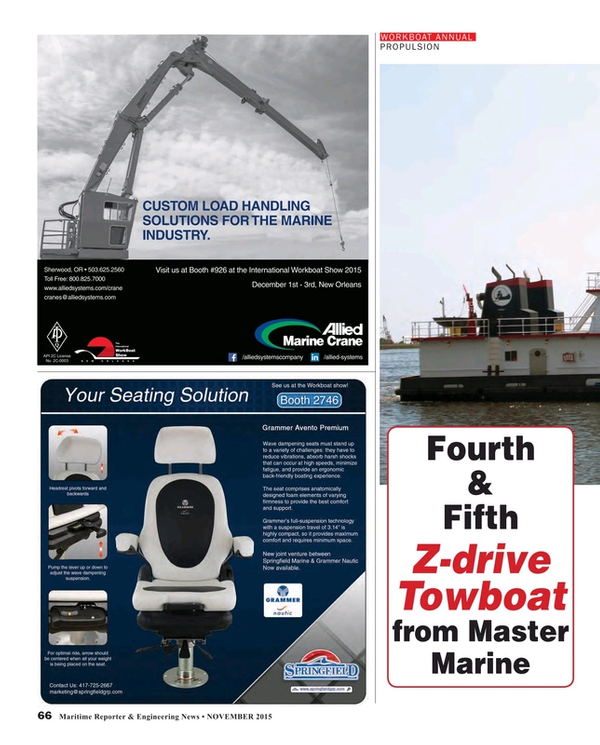 In August and September respectively, Marquette Transportation Co. took delivery of the fourth and fifth 2,000-hp Z-drive towboat from Master Marine, Inc., Bayou La Batre, Ala. The 78 x 34 x11-ft. St. Peter was designed by Frank Basile of Entech & Associates, Houma, La., for Marquette’s Gulf-Inland division, based in Harahan, La. Master Marine is continuing to build Z-Drive towboats, with more underway for Marquette, said the yard’s president Randy Orr. The steel-hulled St. Peter is powered by a pair of Thompson Power Systems Caterpillar C32 Tier 3 1,000-hp engines at 1,800 rpm connected to ZF Marine ZF AT 5111WM-FP Z-drives with 1,650 mm (65-in.) four-bladed propellers in nozzles. The package gives the boat a running speed of 10 knots with a loaded draft of 8 ft. For ship’s service power the towboat is outfitted with a pair of Kennedy Engine John Deere 4045AFM85 Tier 3 generator drive engines each driving an 80-kW Marathon Mariner generators. Cooling for all engines and z drives was provided by Eastpark Radiator Duraweld coolers. Doors and windows were provided by Dales Welding & Fabrication, LLC. Rubber bumper systems were provided by Schuyler Companies. The electronics was supplied by New World Electronics and the Rio Marine supplied the alarms and monitoring systems. To secure barge tows, there’s a pair of Patterson 40-ton deck winches supplied by Donavan Marine. The St. Peter has tankage for 24,000 gallons of fuel; 6,550 gallons of potable water; and 17,560 gallons of ballast water.